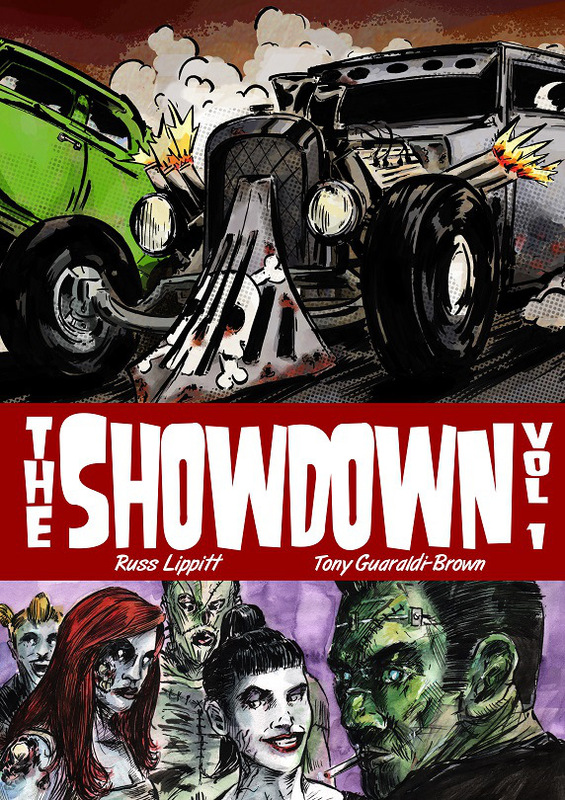 Just in time for Halloween, Russ Lippitt and Tony Guaraldi-Brown are bringing their successful kickstarted graphic novel, The Showdown, Vol. 1 to the masses. Hell's death race between the worst monsters, creatures, and killers vie for a chance to return to the land of the living in a horror exploitation tale that's not for the weak. As legend has it, monsters such as Vampires, Werewolves, and Zombies once roamed the face of the earth but were banished to Hell for their unspeakable acts on humanity. Now in the depths of Dante’s vision of Hell, Satan holds a race once a millennium, a race unknown to man called The Showdown. Creatures from all walks of existence challenge one another in this death race exhibition of fantastic horror and campy grindhouse. Even in the fiery depths of Hades there exists cliques. Or gangs to be exact, and they're gearing up for an exciting and brutal race that gives the winner a "get out of hell" pass. We're introduced to the many gangs and this is where Guaraldi-Brown shines. One by one we meet the contenders leading to a single poster page for each. The designs of vampires, werewolves, and zombies are classic but innovative in their decay and disturbing appearance. The greasers are especially compelling because you rarely see them represented in comics these days and the story is a mash-up of The Outsiders, Death Race 2000, and classic monster movies. Guaraldi-Brown's indie style of art is rough with a slight abstract flair that reminds one of Ben Templesmith's work. It's dark, dreary, and unpleasant as it should be considering it takes place in the bowels of Hell. The crude art has its charm and adds a level of terror and energy to each scene. It's not perfect and clean and that's the point. The Showdown, Vol. 1 serves as an introduction to a terrifying world full of fast and furious monsters in a cutthroat race to freedom. It builds up to a climatic finish leaving the reader wanting more. Support indie creators and give this horror title a chance.